Amir Bar-Lev’s documentary film, The Tillman Story, has just opened in limited release in Los Angeles and New York City. The Iraq war began with a Big Lie, that Saddam Hussein was on the verge of obtaining nuclear weapons. That lie was exposed. Other lies and deceptions have followed. Victory in series of wars and the need to sell the public on achieving those victories, function under a set of what military historian and army veteran Andrew Bacevich describes in his book, Washington Rules: America’s Path to Permanent War, as the consensus by which political and military leaders maintain our nation’s never ending state of war. The Main Stream Media is an eager ally in selling the official version of war generated by the “Washington Rules” of permanent war. The MSM does this by giving the public what it wants, specifically, war heroes, sacrificing soldiers, their families and a low-keyed treatment of casualties, ours or theirs. Occasionally, when news from the war hits bad news bumps like Abu Gharib, “patriotic scripts” are created to justify our state of permanence, scripts with heroes and happy endings. The Tillman Story is one of those stories. Reviews, like this one by Stephen Holden, from the New York Times have been favorable. That was probably the assumption of the military brass who concocted a bogus account of the combat death of Pat Tillman, a football star and a casualty of so-called friendly fire in Afghanistan in April 2004 at age 27. The official story initially had him saving the lives of fellow soldiers during a mountain ambush by the Taliban. It was a flag-waving, “Rambo”-worthy feel-good fantasy that played well on television. But as Amir Bar-Lev’s sorrowful, devastating documentary reveals, not every soldier or every soldier’s family is willing to be so glorified. The documentary reveals the dark story of how the US Army followed a script that appears to have originated in the highest echelons of the Bush Administration. The script needed a war hero, and Tillman’s death looked like a God-send. He had been a star at Arizona State, and was a safety for the Arizona Cardinals. After 911, he and his brother, with the support of his soon-to-be bride, Marie, enlisted in the army. Tillman walked away from a $3.6 million professional football contract. He was that patriotic. By 2002, however, according to Russell Baer, one of his army buddies, when the bombing of Baghdad began, Pat Tillman told Baer, “This war is just so f——–illegal”. That particular profane term was used so frequently by the Tillman brothers that an older next door couple admitted, smiling, that it “was just the way the Tillman boys talked”. Unfortunately for the creators of the script, Tillman did not die in a fire fight with the Taliban. He was killed by friendly fire. Undeterred by the truth, Tillman’s superiors assigned a soldier from Tillman’s unit to accompany his body for burial to Arizona. They had tried unsuccessfully to persuade Tillman’s wife and parents to let him be buried in Arlington Cemetery. Knowing he was a high profile soldier, Tillman had signed an army document asking that, in the event of his death, he not be given any more military honors than the average enlisted man. His wife had a copy of that document and stood firm. Her husband would be buried in Arizona, as he had requested. At a ceremony in a public park, the soldier who accompanied Tillman’s body home, read the Army’s false version of his death from his silver star commendation. He did so under orders from his superiors, fully away that it was a false version, which he predicted would eventually surface. The documetary tells this story in detail, explaining how the Army counted on the Tillman family not to press for further details of Pat’s death, and to accept his role as an American hero. They picked the wrong family to try and sell a falsehood, most notably Pat’s mother, Mary Tillman, who spent months pouring over more than 3000 pages of the army’s heavily redacted investigation into events that transpired when Pat died. The trailer for the film, posted above, offers snippets and comments from Tillman family members. In one climactic scene we hear the testimony of generals and former Secretary of Defense Donald Rumsfeld, disclaiming any responsibility for not giving the public the full story until years later. Ironically, this film connects to an earlier “war hero” tale generated, falsely, by the US Army during the Iraq war, the staged “rescue” from an Iraqi hospital of US Army Private Jessica Lynch. Pat Tillman and his brother, Kevin Tillman (see his testimony below), were both on duty in Iraq with their US Special Forces unit, which was guarding the hospital in which the Lynch “rescue” was videotaped by an army movie unit. The BBC broadcast on the Lynch rescue ran in Britain on Sunday 18 May, 2003. BBC war correspondent John Kampfner directed the documentary. He describes the film on the BBC web site. 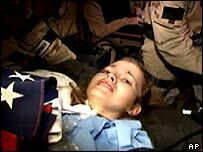 Private Jessica Lynch became an icon of the war, and the story of her capture by the Iraqis and her rescue by US special forces became one of the great patriotic moments of the conflict. But her story is one of the most stunning pieces of news management ever conceived. Private Lynch, a 19-year-old army clerk from Palestine, West Virginia, was captured when her company took a wrong turning just outside Nasiriya and was ambushed. Nine of her comrades were killed and Private Lynch was taken to the local hospital, which at the time was swarming with Fedayeen. Eight days later US special forces stormed the hospital, capturing the “dramatic” events on a night vision camera. They were said to have come under fire from inside and outside the building, but they made it to Lynch and whisked her away by helicopter Reports claimed that she had stab and bullet wounds and that she had been slapped about on her hospital bed and interrogated. But Iraqi doctors in Nasiriya say they provided the best treatment they could for the soldier in the midst of war. She was assigned the only specialist bed in the hospital and one of only two nurses on the floor. The facts about Pat Tillman’s death did not emerge until Mary Tillman, Pat’s father, Patrick, Sr., and other Tillman family members, diligently explored what really happened to Corporal Pat Tillman. This is, as Time magazine critic Richard Corliss writes, “one attractive, thoughtful, ornery, heroic family”. As Amir Bar-Lev’s documentary points out, it was a letter written by Pat’s father to the Army which described his former wife’s (they are divorced) research into the deliberate falsification of Tillman’s death. Mary’s husband demanded a congressional investigation, a demand that was finally heard and led to a congressional hearing chaired by California Congressman Henry Waxman. Mary Tillman told the committee of her experience of telling military officials that she knew her son was killed by friendly fire. In the documentary, Waxman asks the generals and former Secretary of Defense Donald Rumsfeld if they could recall when they received the memorandum that warned the President about the falsification of Tillman’s death. Each man responded that they could not recall when they learned that an army hoax was about to be exposed. The memorandum was a P-4 document sent to President Bush from General Stanley McChrystal, then commander of Special Forces in Afghanistan, who was later appointed by President Obama to command all forces in the region. President Obama relieved General McChrystal of his duties after the publication of a Rolling Stones article in which the general was highly critical of the president and other government leaders. Copies of the general’s memo were sent to all the key officers in the chain of command. The memo did not become public until an anonymous source made it public. The P-4 (“for the president”) memo warned President Bush that the Tillman death story was bogus and that the army not only lied about the death but had orchestrated a cover up to keep it from reaching the public. That testimony of Rumsfeld and the generals is reminiscent of the 1969 film, Z. A pulse-pounding political thriller, Greek expatriate director Costa-Gavras’s Z was one of the cinematic sensations of the late sixties, and remains among the most vital dispatches from that hallowed era of filmmaking. This Academy Award winner—loosely based on the 1963 assassination of Greek left-wing activist Gregoris Lambrakis—stars Yves Montand as a prominent politician and doctor whose public murder amid a violent demonstration is covered up by military and government officials. Jean-Louis Trintignant is the tenacious magistrate who’s determined not to let them get away with it. General McChrystal, author of the P-4 memorandum warning President Bush that the army’s false version of the Tillman death was about to be exposed, retired from the army in June of this year. In August, McChrystal was named as a senior fellow at Yale University’s Jackson Institute for Global Affairs. “I am extremely excited to be teaching at Yale and I look forward to sharing my experiences and insights as a career military officer,” McChrystal said in a statement. The release of the The Tillman Story has drawn new attention to the 2009 book written by veteran non-fiction author Jon Krakauer on the death of Cpl. Tillman. The book, which was published in a paperback edition in July, 2010, is entitled, Where Men Win Glory: The Odyssey of Pat Tillman. The general was summoned to the U.S. Senate to be grilled by the Armed Services Committee. Although McChrystal had enthusiastic admirers on both sides of the congressional aisle and was regarded as an innovative, uncommonly effective leader, he was expected to face difficult questions about two incidents that occurred during his tenure as leader of the Joint Special Operations Command (or JSOC): the torture of detainees in 2003 at the secret facility in Iraq known as Camp Nama, and his role in the coverup of Pat Tillman’s fratricide in Afghanistan in 2004. During the committee hearing, though, none of McChrystal’s inquisitors probed deeply into either of these issues, and on June 10 the Senate unanimously confirmed his nomination. After he was dismissed by the president following the publication of a Rolling Stones article, in which he was highly critical of the president, McChrystal retired. He will begin teaching at Yale in September. Jim – thank you very much for this post. I am reminded of the central reaction I had to the movie “Restrepo,” which chronicled the 15-month deployment of Battle Company in the Korengal Valley of Afghanistan. Namely, whether you are talking about an American soldier and their families, about an aid worker or journalist, or a civilian of the country with which we are at war, the American government and the American people (myself included) owe far more to these individuals than we are currently sacrificing. Our politicians, pundits, and public wrap themselves in a flag (usually in the form of a lapel pin or bumper sticker), clap for soldiers in the airport, and may lip service to the wounded and dead in a variety of ways. Yet our so-called ‘leaders’ have left our soldiers twisting in the wind when they come home through shortages in funding for medical or mental health treatment (resulting in astronomical rates of suicide and home foreclosures among veterans), our public balks at the tax funds needed to help rebuild these countries that we profess to care about (and spread democracy to), and there is scant if any media attention about the stories of government malfeasance or obscene private defense contracts by our media. The real tribute to be paid should be first a reluctance to involve our country in such wars but once we are committed, to remain vigilant about the conduct of those who sacrifice our sons and daughters. Shortly after Sundance, Bar-Lev emailed me that “he was pretty hard on the Democratic Congress in his film.” True, his film does portray Congressman Waxman’s Oversight Committee as ineptly failing to get answers from the top military leadership during their hearing. However, Bar-Lev’s film missed the ”untold story” that both the Democratic Congress and the Obama Presidency have intentionally protected General Stanley McChrystal from scrutiny and punishment for his central role in the cover-up of Pat Tillman’s friendly-fire death. This cover-up was a thoroughly bi-partisan affair. It wasn’t just a case of the Bush administration and the Army stonewalling the Democratic Congress. Congress didn’t just “fumble” the ball, they threw the game. Five years ago, Pat Tillman’s family were handed a tarnished Silver Star. It was a travesty of justice that President Obama and the Senate promoted General McChrystal to the Army’s highest rank, and handed him his fourth star. It’s not surprising that after their initial cover-up of Pat Tillman’s friendly-fire death fell apart, Army officers and the Bush administration lied to protect their careers. But after they took control of both Houses of Congress in 2006, the Democrats (including Congressman Waxman, Senator Levin, and Senator Webb) and Senator McCain) could have gone after those responsible. Or at least not promoted them twice! Just before the 2006 mid-term elections, Kevin Tillman published his eloquent letter, “After Pat’s Birthday”. Kevin had hoped a Democratic Congress would bring accountability back to our country. But, just as with warrantless wiretapping and torture, those responsible for the cover-up of his brother’s friendly-fire death have never been held accountable for their actions. And the media’s been part of the whitewash as well (e.g. I detail my encounter with NYT’s Thom Shanker and CNAS’s Andrew Exum who both “exonerated” McChrystal of all wrong-doing.